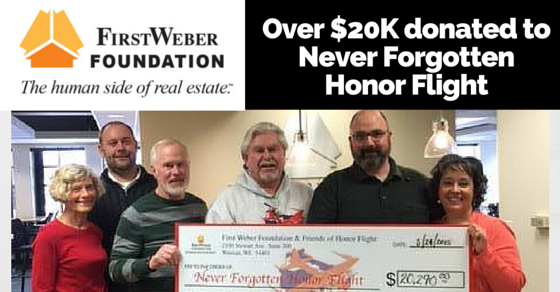 Bike for Honor Flight Fundraiser, led by First Weber in Central WI, was able to make the formal presentation to Never Forgotten Honor Flight recently. The final total with matching funds from The First Weber Foundation for the 2015 fundraiser was $20,290! Bike for Honor Flight is an event that raises money to support the local Never Forgotten Honor Flight, which sends our local central WI Veterans to Washington DC on the trip of a lifetime to see the memorials which stand in their honor. The bicycle event was held on August 24th, 2015. To date, NFHF has sent 2,004 local veterans from WWII, Korea and Vietnam on 22 flights to Washington DC. They currently have a waiting list and / or plans for 8 additional flights in the future. First Weber Foundation is a huge partner for us in this event. Collectively, they contributed over $12,000 in sponsorship, pledges, matching funds…and that’s not to mention the many volunteers from our local First Weber agents & affiliates in Central WI who make this event such a huge success. The grand total from sponsors, registrations, pledges, donations and the First Weber Foundation was $20,290 for the one-day event! Reade more about the First Weber Foundation here and here.